Welcome to the New Release post and Blog Hop showcasing projects from Our Daily Bread Designs June Release! You can see all of the June Releases here. Continue reading below to find out how you can win one of three $25 Gift Certificates to the ODBD Store good towards the purchase of ODBD stamps. Today, I'm sharing two projects using products from the new June Release along with some additional ODBD products (see product list below). My first project is a 3D Tool Box, it measures 3-3/4" x 6" and is perfect for treats, trinkets and gift cards! I stamped the Happy Father's Day Tools in Coffee Ink on Vanilla card stock, clear embossed the sentiment and colored using markers, then die cut the panel and layered it onto an Espresso panel. To embellish the tool box, I die cut and embossed the tools from colored and Silver card stock using the Workshop Tools Dies. After die cutting from the colored card stock, I simply snipped the handles and used a Quickie Glue Pen to adhere them to the silver die cut tools, then sponged the edges of the card stock. Using the Pegboard and Hooks Dies, I cut the pegboard from Vanilla card stock, then cut it in half to be used on the tool box as shown, added the hooks and tools. The sentiment panel is popped up on dimensionals. To embellish the top of the box, I die cut the smallest tag from Espresso card stock using the Recipe and Tags Dies, added a panel of Cherry card stock and a scrap of the die cut pegboard, then added a few of the tools and a stamped tag that was stamped with "Dad" from the World's Greatest stamp set and die cut using one of the tags from the Mini Tags Dies. My next projects is a Shirt card that uses the new Vintage Ephemera Paper Collection, Good Man and Belles Vignes stamp sets and the Layered Lacey Squares die set. The shirt is cut from Espresso card stock and stamped with the vine from the Belles Vignes stamp set to add a design to the card stock. The vest and tie are cut from the Vintage Ephemera Paper Collection, and the sentiment from the Good Man stamp set is stamped in Espresso ink and clear embossed. On the inside, I stamped and embossed another sentiment from the Good Man stamp set on a scrap of the pattern paper, die cut using Circle Dies and layered it onto an Espresso panel, then onto a pattern paper panel that was die cut using one of the dies from the Layered Lacey Squares die set. Three randomly selected winners will each receive a $25 gift certificate to Our Daily Bread Designs, good towards the purchase of ODBD stamps found in the "stamps column" of the ODBD Website, just for commenting on the Design Team cards! You have until June 2, 2015 at 9:00 p.m. EDT to leave your comments. The Winners will be posted June 3rd, on Our Daily Bread Designs Blog, so be sure to check back there to see if you won! OH what fabulous fun cards you created. Love the tool box. Hi teamie. WOWZA! That is a super fantastic TOOL BOX! LOVE, LOVE, LOVE. And the SHIRT - Brilliant! Amazing talent, beautifully handsome designs! Two great guy projects. Love the toolbox for the handy guy in your life -- and the shirt for when he cleans up! A fabulous toolbox. I love the shirt, it is really cute. These are fantastic! I love that tool box. These are great creations showing the new products. That tool box is just perfect! Love it! Great job on your projects! That tool box is amazing!! Wow!!! Love all the details on it. The shirt card is a wonderful masculine card too. Love it. What fabulous samples!! That toolbox is super creative and I love the shirt card..WOWZA!!! Excellent! So creative and unusual. Well done. Love all the designs you can make with the Tool Time Dies. Creating a toolbox for the tools was fierce! I love the idea. Love the toolbox Lisa! So cool! The shirt is a great idea too for a dad's card! Very clever!!! the tool box is just awesome, great way of putting it together and embellishing. Fun shirt idea too! That tool box looks so real!!! The shirt card is clever. Love your creativity and thank you for explaining how you made the tool box card!! Both are inventive! The tool box is awesome! great masculine projects with these products. wow! ur creations are amazing!! Amazing creations, Lisa!! Love the tool box you created with the pegboard front and all your amazing details!! 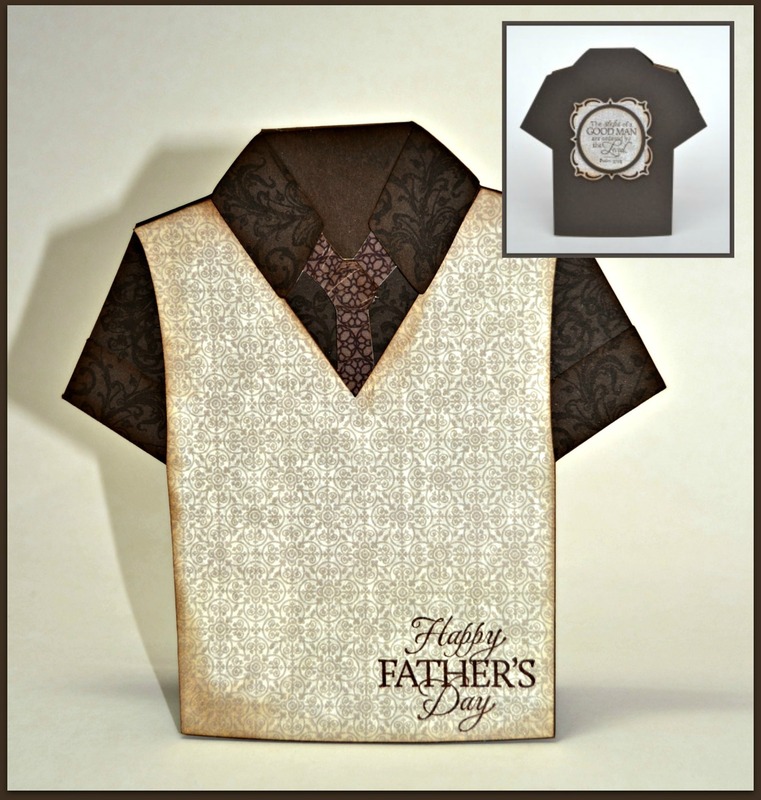 The shirt card is so creative and perfect for a Father's Day card!! Love how you used the new dp for it!! Oh, Queen of Cuts! What fabulous samples!!! Awesome toolbox! Love the diamond plate embossing...perfect. And a shirt... so creative!!! What amazing projects - great tool box and a wonderful shirt. Thanks for sharing. Great little gift box with all the little tools. So many fun surprises would fit in this for that special man. I really love the cardstock you chose for the Shirt card. It is just perfect for this fun card. Oh, the shirt card is such a clever idea and a great way to showcase the new papers! LOVE your toolbox! A gift in itself! Lisa - wow! Two amazing projects - I am in love with your 3D toolbox!! It looks so real!! And the shirt card??!!! Wowzers is that ever creative and made to perfection. Beautiful samples Lisa! Oh man Lisa!!! I love your tool box!!! Sooooo cute!!!! And the shirt is great too!!! 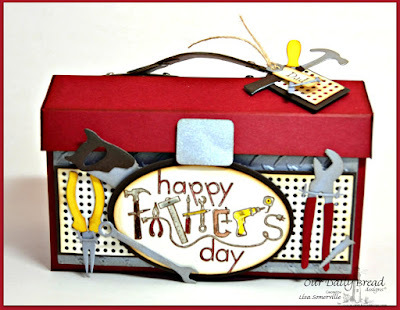 Lisa, the tool box is fabulous...so fun and the shirt card is awesome too! Two perfect masculine creations! Terrific masculine cards, Lisa! Wonderful tool box card w/ the yellow & red colors and your shirt card is so fun!